GFA is able to support the drilling of a well for only $1400. Each Jesus Well provides clean drinking water to approximately 300 people at a cost of less than $5 per person for up to two decades of supply. 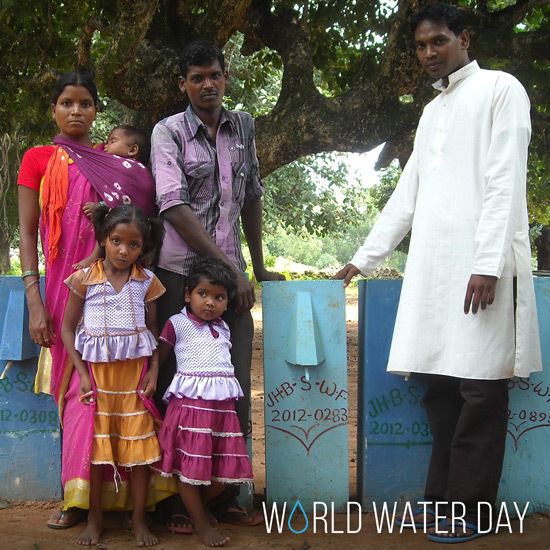 GFA's clean water ministry is delivering safe, disease-free water to families across Asia through Jesus Wells. 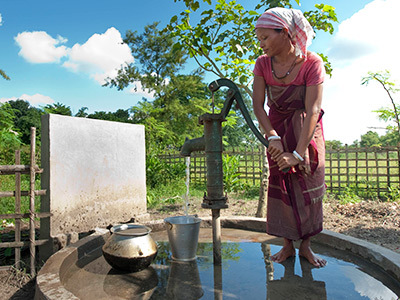 Finding water that will not cause death in the family is a challenge many people in Asia face. Many women and children are forced to walk hours a day to distant water sources, such as filthy ponds or lakes, and even then the water may be contaminated. Sometimes they know this may bring death and sickness to their families, but they have no other choice. But the Lord is using Jesus Wells profoundly. The water is freely offered to all, regardless of their religious or social background. Providing safe water is a practical way to show people how much God loves and cares for them, and Jesus Wells can open the door for people to see the love and mercy of Christ. Read how a Jesus Well transformed Salil's village. Drinking contaminated pond water was the only option for Salil and his family ... until a Jesus Well was drilled in their village. In one northeastern region of South Asia, just beneath the Himalaya Mountains, a river flows, and heavy monsoon rains often cause flooding. It’s difficult to imagine that the residents of this lush land would lack clean drinking water. But it’s true. This is where Salil lives with his wife and three children. Like most of his fellow villagers, Salil makes his living as a labourer. Until recently, all of the villagers drank, bathed in and washed their clothes in water from a local pond. Whenever the river flooded, the pond would fill with sand. When that would happen, they’d have to dig to find the water they needed. But that pond water was contaminated. The villagers suffered from typhoid, jaundice and a variety of horrible skin diseases. They lived daily with nausea, high fevers, diarrhea and general weakness. Their chronic illnesses made it difficult for them to work. So they languished in grinding poverty. It seemed the very water they depended on for life was cursed. Salil watched his family members get sick. He was soon spending most of his meager income on medicine. There wasn’t enough left over to meet their basic needs. Salil needed to make more money, so he traveled to the river valley to collect and sell one thing there was plenty of—sand. Lacking the government permits he needed, Salil worried he might be caught and punished. But he knew he had to provide for his ailing family, so he took the risk. Whenever he could, Salil returned home to take care of his wife and children. But no matter how hard he worked, how much money he made or how often he came home, he couldn’t change the hard facts: Their water was still contaminated, and they were still sick. Unbeknownst to Salil, a nearby pastor named Dayakara had also begun making regular visits to his village. 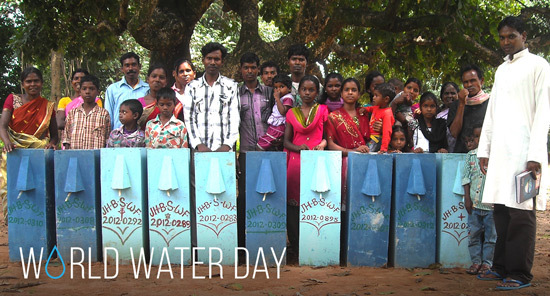 As Dayakara befriended the villagers, he became aware of their water crisis. So he and other GFA-supported workers decided to help. They began drilling a well, right in the center of the village where everyone could access it. That was the beginning of a transformation for Salil’s family and their entire village. When Salil came home for one of his visits, he was astonished to find his wife and children no longer sick. How had this happened? He learned there was a new well in the community, and his wife and children were using it for their daily water needs. He was overjoyed, but he had no idea who was responsible for this wonderful innovation. One day Salil met GFA-supported Pastor Dayakara. As they talked, Salil realized it was this man and his fellow labourers who had brought the well to his people. Salil marveled at their kindness and compassion. He decided he wanted to know this God who could put such love in men’s hearts. Through the generosity of the Christians who provided their new well, Salil and his fellow villagers came to understand the love of Jesus Christ. Others in their village began having similar experiences. Baldev was one of them. A young man with a family to support, Baldev had also gotten sick from the contaminated pond water. He couldn’t work, and like so many others, he and his family suffered. But when he began using water from the new well, his sickness went away. Salil shared the wonderful news of Jesus’ love with him—the news he had recently come to know—and Baldev and his family embraced the Lord in their lives. Now they host regular prayer meetings in their home, led by Salil. Water contaminated with something like arsenic can give a person headaches, confusion, stomach pains, vomiting and diarrhea. Long-term exposure to arsenic can lead to skin diseases, cancer or—if not treated—coma and death. Although other water well projects can cost several times as much, GFA is able to support the drilling of a well for only $1400*.Each Jesus Well serves an average of 300 people for about 20 years, and the wells may be drilled up to 600 feet deep, providing pure water in even the worst droughts. Local labour and materials are used to drill the wells, which keep the costs low. A Jesus Well provides clean water for up to 300 people per day and can last 20 years. That’s clean water for an entire village for only $1400. This life-giving water helps rescue mothers, fathers and children from disease, poverty and death. Jesus Wells can literally save lives—while showing people the love of God. $1400 provides a well that produces clean water for an entire community, saving people from waterborne diseases for years. $140 can help 30 people, $700 can help 150 people, and $1400 can help an average of 300 people. Jesus Wells are a wise investment and we keep the costs low too. The cost per person served with clean water is less than $5 when given toward a well and that provides water for 20 years. What's the cost of a well? A Jesus Well costs $1400; these funds provide for equipment, digging and installation. Each well can serve *300 people a day and the wells often times last *20 years. When looking at the cost of a well per person served, that cost is less than $5 (USD) per person. And the well can be in service for 20 years, which means clean water for $5 (USD) per person for 20 years. That's a great deal. The well provides for both the physical need of clean water and the spiritual needs. Improving a villages overall health and providing ways for workers to interact with villagers. **Statistics from World Health Organization. 2018 Drinking Water Fact Sheet. BioSand water filters are simple, sturdy and, above all, efficient. Built from concrete and filled with sand, rocks and gravel, these simple structures remove 98 percent of biological impurities. When water is accessible but dangerous to drink, BioSand water filters enable a family to purify dirty water, making it drinkable and safe to use. BioSand water filters are perfect solutions for families. Your gift of $30 will provide water that is 98 percent pure. When clean water is available to these families, they are protected from dangerous illnesses and can live healthier lives. 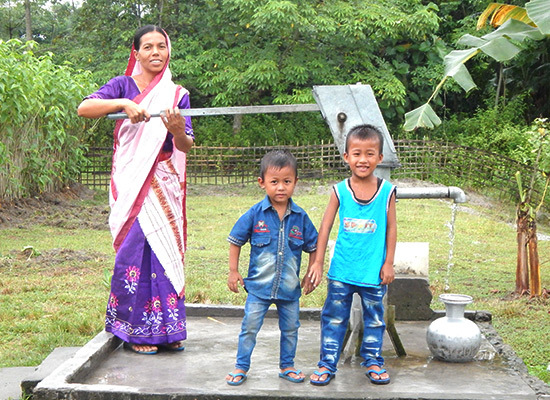 Read how a BioSand water filter transformed Aanjay’s family. Aanjay and his family desperately needed clean water, and GFA-supported pastors in his region were able to give him a BioSand water filter, along with several other families. "I barely remember a single week or month passing by for us without visiting a doctor and spending our minimal income for medicine. I and my family were badly and often exposed to waterborne and water-caused disease, because we were forced to use dirty and filthy water for cooking and drinking which was contaminated from an open well. "Thus, we suffered stomach ache, jaundice, typhoid and diarrhea. At the same time, we were compelled to use an open pond, river or well water for bathing. Due to bathing in filthy water, skin infections occurred on our bodies. Other families, too, were suffering badly due to the use of contaminated and dirty water. My whole village will assert this truth." 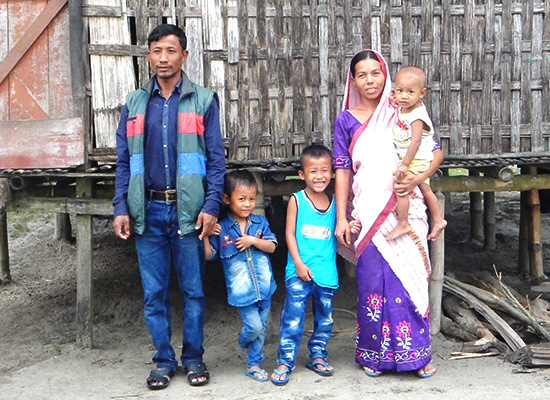 Aanjay and his family (pictured) desperately needed clean water, and GFA-supported pastors in his region were able to give him a BioSand water filter, along with several other families. "Along with receiving a filter, families also received health and hygiene training that works to significantly lower the incidence of waterborne illness. Medical science gives numerous details about uncountable bacteria, named microbes, pathogens or micro-organism in the water. These microbes can be worms. "Now the villagers are getting purely filtered water for drinking. Since [BioSand water filters] were installed, all water-caused and water-borne diseases have ceased, and families got remedy from unnecessary medical expenses. "Not only were the physical water needs of believers and villagers met, but also our inner thirst for love of the Lord and for one another too are being met very strongly. While these filters and training are making an incredible difference in the physical well-being of the recipients, many are also gaining the peace and freedom found in following Jesus Christ." $30 provides a family in Asia with a clean water source that will keep them from contracting life-threatening waterborne diseases for many years.